Having successfully arrived in Moab on Saturday evening, we quickly set out to explore this beautiful area. 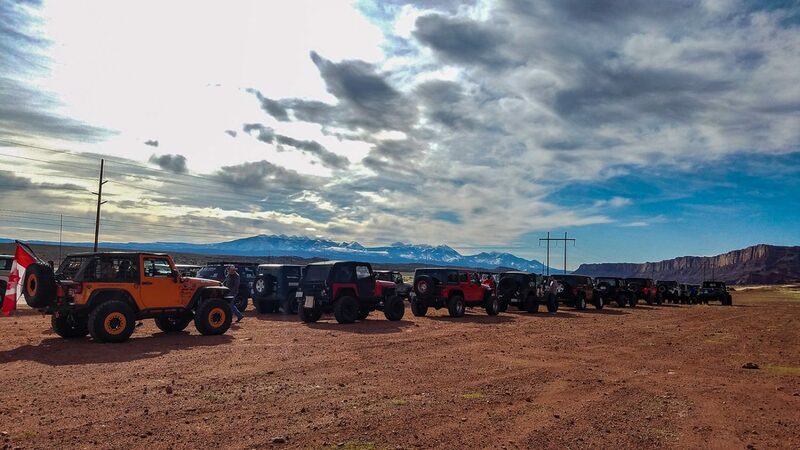 Our first trail was a group ride on Gold Bar Rim Trail, organized by Easter Jeep Safari. A technical rating of 5, the trail features dirt roads, moderate rock crawling with various sized steps, stunning views, and the main obstacle, the waterfall. The waterfall is a 4’ plus ledge that must be passed both going down and back up the trail. With the right line and some finesse, going down for long wheel-based vehicles is relatively easy. Too much speed and the short wheel base vehicles can have some white-knuckle moments as they pogo on their front end. Coming back up this year proved especially difficult for the shorties as they struggled to grip the rock and were often winched up the ledge. With some instruction from the spotters and a little power, the four doors popped up the ledge in quick order. From a Moab virgins point of view, doing an organized run with Easter Jeep Safari was an excellent way to learn the trails. Their guides are experienced and helpful. They were well set up at the waterfall to spot and provide support to rigs in need. The pace kept by the group was a good mix. We spent a self-provided lunch with a sweeping view of canyons, snowy mountains and a winding river a river – plus more than a few Jeeps! Not a bad way to spend a workday! This entry was posted in Events, News and tagged ejs, ejs2019, grand cherokee, maob, ugg.